More and more of us are choosing to be part-time vegetarians these days including myself. By this I mean we’ve adopted a day each week, Meatless Mondays, or 1 or 2 days each month when we don’t eat meat. Whether you’re vegetarian for personal beliefs, health reasons or simply trying to reduce your carbon footprint, kudos to you! It’s a profound commitment to yourself and to your environment. See the video below for instructions. 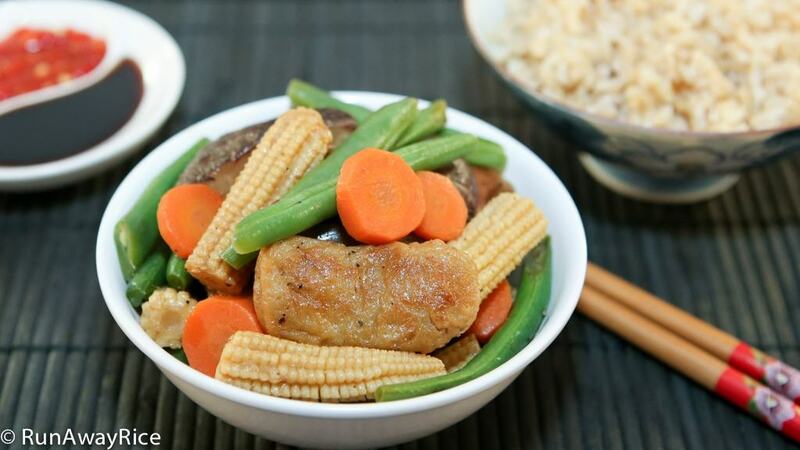 If you enjoyed this recipe, you may also like: Curry Lemongrass Seitan Stir-Fry (Mi Can Xao Xa Ot) and Mock Roast Pork/Seitan Roast Pork (Mi Can Xa Xiu). Soak the dried shiitake mushrooms in a bowl of warm water. Swirl the mushrooms in the water and then allow to soak for 30 minutes. Drain the baby corn and set aside. Cut a 4-inch section of the leek starting at the root. Peel and discard the outer skin. Cut the leek into 2-inch lengths and then julienne. Peel carrots and then cut into coins about 1/4-inch thick. Drain the mushrooms. Cut in half and then cut off the stems. Trim ends off the green beans and then cut in half. Blanch in boiling water for 15 seconds then dunk in a bowl of ice water for 30 seconds. Drain in a colander. To make the sauce, combine water, sugar, soy sauce, ground soy bean sauce, and vegetarian stir fry sauce. Stir together combining all ingredients well. Heat a large pot or pan over Medium High heat. When the pan is hot, add the vegetable oil and and leeks. Stir fry for for 30 seconds. Add the green beans and stir fry for 2 minutes. If the green beans seem dry, add 1 Tbsp of water and continue stir frying. Add the carrots and stir fry for another minute. Add the mushrooms, baby corn and seitan and toss together. Drizzle the sauce over the vegetables and seitan. Combine together distributing the sauce and coating everything evenly. Cover the pot and simmer on Low heat for 5 minutes. 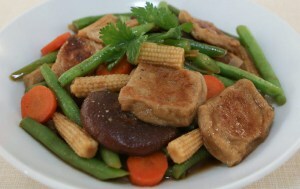 Stir the seitan and vegetables again combining with the sauce. Cover and simmer for another 10-15 minutes. Adjust the cooking time depending on how crunchy you like the vegetables. Finish with freshly ground black pepper.